Army Sgt. 1st Class Eric Emond, 39, was killed by a roadside bomb Tuesday. He leaves behind a wife and three young daughters. One of the three U.S. troops killed in Afghanistan earlier this week was a Massachusetts native. Army Sgt. 1st Class Eric Emond, 39, was a Fall River native who went to Durfee High School. He also lived in Dorchester from 2010 to 2013, according to Congressman Seth Moulton's office. Emond, who most recently lived in North Carolina, leaves behind his wife and three young daughters. Magoon says Emond helped start Massachusetts Fallen Heroes, a nonprofit that helps Gold Star families and fellow veterans, because he wanted to give back. “He was the bedrock of the organization and building what we have today,” Magoon said. While Emond was back in Massachusetts rehabbing years ago, he also helped with the design of the fallen hero memorial in Boston’s Seaport district. 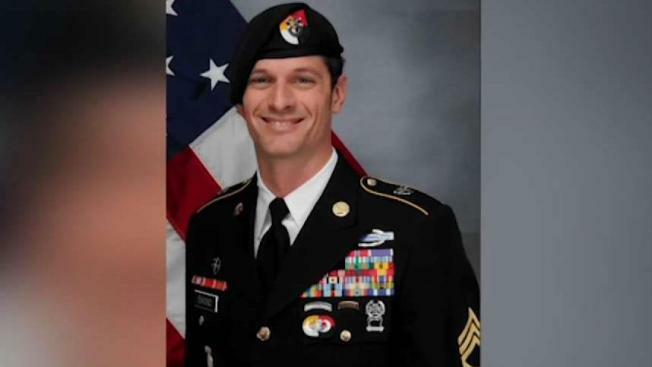 “He had already been injured, he had already been blown up, he had already had a chance with death that he came back from and he was supposed to get out of the military and went back,” Magoon said. Another Gold Star brother says it’s painful to believe Emond’s name will now be etched in the same memorial he helped create. “I think when they built this family organization, monument I don’t think he ever expected to be a part of it in this way,” said Jay Farrar, who lost his brother Sgt. Andrew Farrar in 2005 on his 31st birthday in Iraq. Both Massachusetts Governor Charlie Baker and Boston Mayor Marty Walsh issued statements Wednesday, expressing their condolences to Emond’s family and honoring his service to our country. "I offer my deepest sympathies to the families of all three service members who gave the greatest sacrifice serving our country, including our own Army Sgt. 1st Class Eric Michael Emond," Mayor Walsh said. Emond was killed by a roadside bomb on Tuesday. Also killed were Army Capt. Andrew Patrick Ross, 29, of Lexington, Virginia, and Air Force Staff Sgt. Dylan J. Elchin, 25, of Hookstown, Pennsylvania. Three other service members and an American contractor were wounded. They were killed in the Ghazni province, an area where the Taliban is resurgent. The Taliban claimed the attack, saying a U.S. tank was completely destroyed. It was the deadliest attack against U.S. forces in Afghanistan this year. "Massachusetts lost a son and hero in Afghanistan," Moulton said on Twitter. "SFC Eric Emond served his country bravely and honorably both overseas and at home." Emond and Ross were assigned to 1st Battalion, 3rd Special Forces Group, based at Fort Bragg in North Carolina. Emond had previously served in the Marines. Elchin was assigned to the 26th Special Tactics Squadron, based at Cannon Air Force Base in New Mexico.